Jenna Condie is a Lecturer in Psychology in the School of Health Sciences at the University of Salford. She is also the network's avid Twitter Manager. Contact her on @jennacondie. Although an advocate of both digital communication and qualitative methods, I am yet to combine these two interests to carry out qualitative interviews online. The timing therefore seemed right for me to review ‘Qualitative Online Interviews’ by Dr Janet Salmons, as I do want (or need!) to learn more about this growing approach within social science research. ‘Qualitative Online Interviews’ guides the novice researcher through the entire research process from start to finish. Not to be “shelved after a single reading” (Salmons, 2015, p. xviii), this book is designed as a ‘go to’ resource to consult as and when a particular research issue arises. The updates in the second edition reflect the increasingly mediated nature of our social lives since the first edition was published in 2010. An e-interview research framework (see figure below) has been introduced to structure the book and to link the various issues involved in using an online interview research design (e.g. ethics, sampling). A second update broadens out what constitutes an online interview as the previous edition focused on synchronous interviews alone. This edition incorporates the use of near-synchronous and asynchronous interviews. 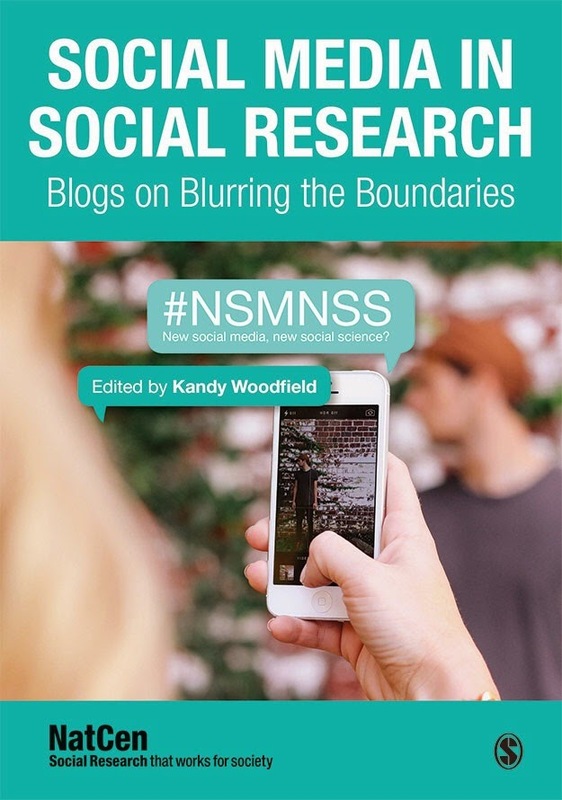 A third change is that the book addresses additional online data that may be available to a qualitative researcher such as user-generated content including written posts, images, and other shared texts. With those changes in mind, perhaps a more appropriate title could be ‘Online Qualitative Research’ as Salmons (2015) points out, the boundaries between what is an interview and what is not are seemingly less clear in an online context. I felt that the concept of ‘interview’ was perhaps restrictive due to its dominant meaning as observations, notes, and user-generated content are included. That this book goes beyond interviews could also go some way to broadening its appeal to those embarking upon online qualitative research in general. Granted, the book’s focus may then be diluted given the vastness and creativity that digital communication tools and user-generated content present to the contemporary researcher. However, the underlying principles of qualitative research – whether online or offline, whether interview or another type of online data – are also covered in this book. 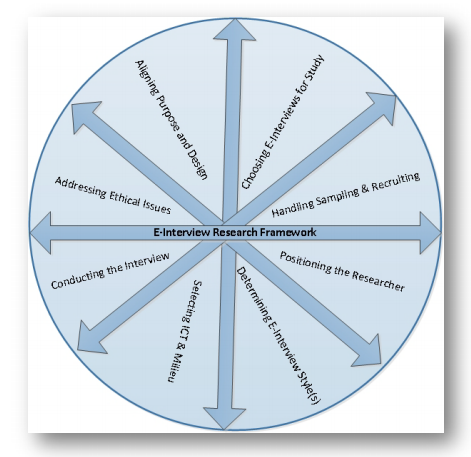 To give an example, a segment of the above e-interview research framework focuses on how the researcher must take a position in their research. Such principles apply to most qualitative approaches. As a lecturer, I could use ‘Qualitative Online Interviews’ as an introductory resource for my undergraduate psychology students, particularly those about to start their dissertation research. I do feel that this book is perhaps ahead of us in terms of teaching undergraduate psychology. I can only speak from my own experiences of undergraduate supervision where the ethics process is challenging enough without throwing issues of researcher-participant online interaction into the mix. In terms of masters dissertations and PhD theses, this book could be a great companion to a researcher navigating the ‘swamp’ (Finlay, 2002) of online qualitative research. Salmons (2015) also points to further reading that the researcher may need for deeper discussions around epistemology, ontology, and theory. What this book did for me as an early career researcher was open up the option of carrying out qualitative interviews online through practical examples and solutions for taking the next step. The default does not need to be face-to-face these days. I haven’t carried out interviews online before as the people I need to speak to are often close by, or in many cases, do not have access to ICT resources. Salmons (2015) recognises that online is not always the most appropriate option but also highlights the greater reach and potential of going digital to learn more about human experiences and to engage a wider audience in research. It would be great if the book cover and the presentation/layout inside (e.g. diagrams, font, etc.) were more modern in design to reflect the potential contained in this edition. Because this book is one for the future, my future work, and the future work of social science students who are likely to engage in online research more and more. Maximising your digital marketing strategy to obtain global customers has never been such an essential business need. Learn digital marketing in hyderabad at imarks for a bright growth of your career.